The hamlet emerged after the enclosure of the Dicker, a common, in the early C19. 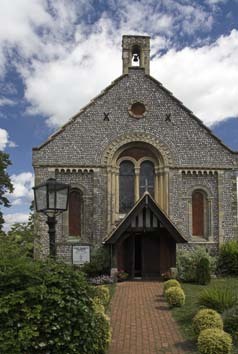 By 1843 it was sufficiently substantial to become an ecclesiastical district, mainly in the parish of Arlington, but also including parts of Hellingly and Chiddingly. W Donthorne (ICBS) designed a chapel costing £1400 (SRS 75 p101) while working at Folkington Hall not far away. This became parochial in 1857. 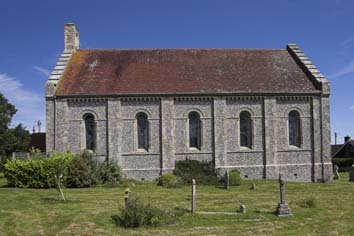 The church consists of an aisleless flint nave and only the neo-Norman style, briefly popular in the early 1840s, differentiates it from most chapels of the period. Outside, a heavy west arch contains a coarsely moulded, shafted two-light window in more or less correct style with a tympanum of patterned brick and there is an undersized stone belfry on the gable. 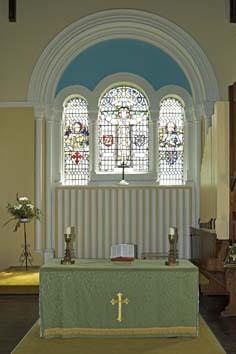 An arch at the east end contains a triple window, but if a chancel was ever intended, Donthorne’s plans submitted to the ICBS do not show one. The thin tiebeam roof has many curved braces. The east arch contains the altar with mouldings and shafts recalling the west one. 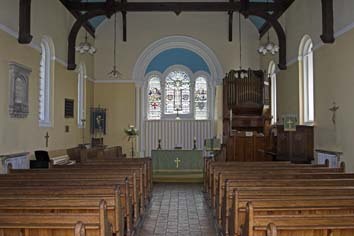 The then vicar, G M Russell, added a half-timbered west porch in the 1890s (1 p23) and the interior was repainted in the 1960s or 1970s, with contrasting colours, which the architect would not have foreseen. Font: A shallow octagonal, possibly marble bowl, on a slender stem, with the date 1663 and the initials CW in rough letters. In 1843 the Archdeacon of Lewes, J C Hare, wrote to the ICBS, who had deplored the lack of a font, saying ‘I happen to have an old one of marble, the work of Sir Christopher Wren, which I am able to give to the new church’. How he came by the font, he does not say, though the attribution to Wren has no solid basis beyond the coincidence of initials on the bowl. Glass: (East and north nave, third windows) G K Gray, 1922 and 1928 (in memory of G M Russell) (ibid). Monument: Emeric Owen Vidal, First Bishop of Sierra Leone (d1857) by L Parsons (from the date, actually by C Parsons) (Roscoe p952). The bishop had been the first incumbent (Mee p116). Pulpit: Adapted by Russell from two others (ibid). Screen: (At the west end) Designed and made by Russell with thin, gothic detail (ibid). My thanks to Nick Wiseman for the photographs.